The Environmental Protection Agency says it issued the new guidelines, called PAGs - for Protective Action Guides - to protect Americans after a “nationally significant” nuclear disaster. But for months, dozens of environmental groups, including the Sierra Club, Greenpeace, Public Citizen, Riverkeeper and Physicians for Social Responsibility USA have been urging the agency to shelve the plan. They say the PAGs could deliver excessive doses of radiation leading to increased risk of cancer and other health effects. EPA officials say they knew they needed to create these guides after seeing what happened in Fukushima, Japan in 2011. A Tsunami knocked out the coolant system of a nuclear reactor, spilling massive amounts of radiation. But Daniel Hirsh, Director of U.C. Santa Cruz’s program on Environmental and Nuclear Policy, says the new EPA rules contradict themselves in several places, leaving many questions about public safety. 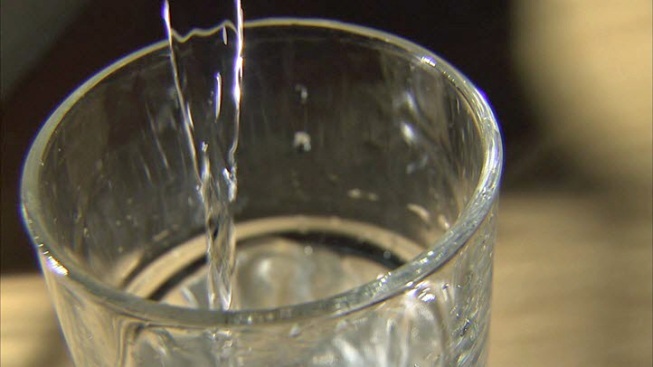 He insists the Safe Drinking Water Act has been an effective guideline for emergencies in the past, and sees no need for the new guidelines. NBC Bay Area first reported on the EPA’s plan last fall. Since then, the EPA has made changes to the language of the water guidelines. The original document called for using the PAGs for any radioactive incident, even a spill from a laboratory or a truck on the highway, and it allowed for the higher levels for several years. See the original document here. Since then, the agency has revised the guidelines. Beauvais told NBC Bay Area that the PAGs would be used for one year or less, and only for a nationally significant nuclear disaster. Daniel Hirsch isn’t satisfied, and admits he doesn’t trust the agency. He points to this chart, obtained by filing a lawsuit against the EPA, which reveals that for many radioactive substances, the new guidelines would allow for a lifetime dose in a month’s time. 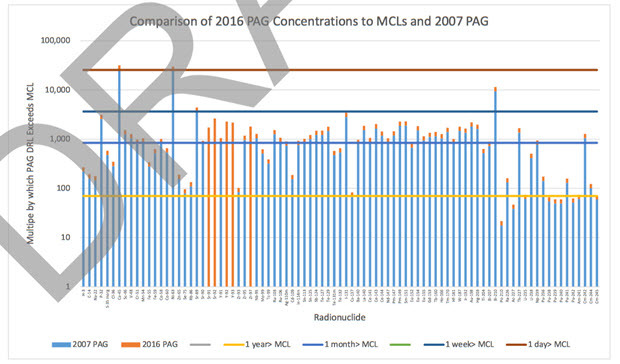 The chart compares the new PAG guidelines to the Safe Drinking Water Act levels, known as MCLs. The vertical lines depict different radioactive materials, or radionuclides. When you reach the horizontal yellow line, you are getting a lifetime of exposure in one year. For those radionuclides that pass the top horizontal bar, the new guidelines would allow you to get a lifetime of exposure in a single month. Hirsch is stunned by the doses shown in the chart, and can’t believe that this has happened in the final weeks of the Obama administration.